Background: Drug stability is essential in the process of drug production, storage, appliance, and so on. Some drugs’ degradation products may even have a toxic side effect, which can result in safety risks and economic losses. Therefore, it is very imperative to develop a suitable stability indicating an analytical method for anastrozole which could be used for stability testing, routine and in-process quality control analysis or other further studies. Methods: A reverse-phase high-performance liquid chromatography method was developed and validated for the degradation kinetics study of anastrozole, a selective non-steroid third-generation aromatase inhibitor, which would provide a basis for further studies on anastrozole. The degradation product was confirmed by ultra-performance liquid chromatography with tandem mass spectrometry. Results: Results showed that the degradation behavior of anastrozole followed first-order kinetics in different temperatures, pH values and oxidation conditions. It was suggested that the degradation behavior of anastrozole was pH-dependent and it’s more stable at lower pH values. Conclusion: A high performance liquid chromatography method was established and used to determine the residual concentration of anastrozole in this study. It was found that the degradation behavior of anastrozole followed first-order kinetics at different temperatures, pH values and oxidation conditions. According to the results, the degradation of anastrozole was found to be pH-dependent and it is more unstable in alkaline conditions. The information of degradation kinetics will be useful for understanding the chemical stability of anastrozole and provide a reference for the further preparation research and clinical therapy of anastrozole. 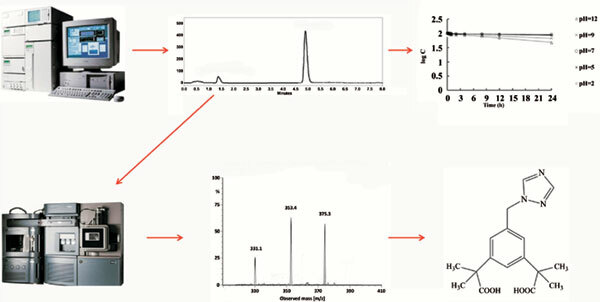 Anastrozole, degradation kinetics, kinetic parameters, first-order plot degradation, RP-HPLC, drug stability.